DESCRIPTION: Panettone is a sweet bread, loaded with candy citron, lemon zest and raisins. The bread is baked in a cylindrical mold, giving it a beautiful, distinctive look. Traditionally prepared for Christmas and New Year in Italy, or enjoyed year-round with a cup of coffee, Panettone is an authentic treat that is ideal for life’s celebrations—small or big. 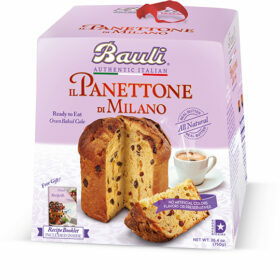 Il Panettone di Milano made by Bauli features simple, back-to-basics ingredients including real butter, sugar, eggs, raisins and glazed orange peel.